The Communist Party of China (CPC) unveiled a landmark policy drive yesterday to curb mounting social inequality and develop a fair and just society as top leaders ended a four-day plenary session. The blueprint, aimed at building a "harmonious society," mapped out guidelines for the country's sustainable social and economic development by 2020, ranging from reducing the wealth gap to cracking down on corruption. The efforts to spread China's newfound prosperity more evenly came at the end of the Sixth Plenum of the 16th CPC Central Committee, attended in Beijing by about 350 full and alternate members. 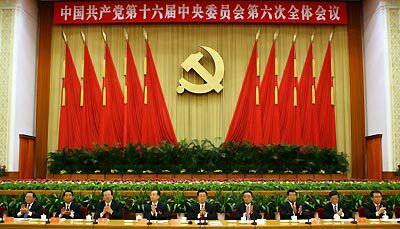 The annual plenum approved the "Resolutions of the CPC Central Committee on Major Issues Regarding the Building of a Harmonious Socialist Society," according to a communique issued after the meeting. The communique said the 17th Party Congress will convene in Beijing in the second half of 2007. The Xinhua News Agency said it was the first time for the Party to devote a plenary meeting specifically to social development issues other than political and economic affairs. "There are many conflicts and problems affecting social harmony," a statement adopted by the plenum said. "We must always remain clear-headed and be vigilant even in tranquil times." The warning was apparently referring to a growing number of social woes such as rampant pollution, a growing wealth disparity as well as complaints about the high cost of education, housing and medical services. Although the country's economy has surged during the past three decades to bring wealth to some, millions of farmers, migrant workers and needy urbanites have been left behind. While urging that social harmony occupy a "more prominent position," the communique said the Party in the next 15 years will commit itself to improving the democratic legal system and human rights protection, narrowing the wealth gap, increasing employment, improving the government's public service, promoting people's moral standards, securing public order and protecting the environment. To achieve these goals, the plenum stressed that "more efforts shall be made to co-ordinate economic and social development, promote social equity and justice and strengthen social affairs management and services." It singled out rural development, employment, education, medical services, environmental protection, income distribution and social security systems as key sectors that should be given priority. The Party also made it clear that it will seek to maintain rapid economic growth. "A harmonious society above all needs development," the communique said. The meeting also called for strenuous efforts to continue the fight against corruption and improve supervision over leading officials and organizations. The call highlighted the urgency of the Party's anti-graft campaign following its ousting of Chen Liangyu, the Shanghai Party secretary and a Politburo member, on September 25. Charges of corruption against Chen are under investigation. Building social harmony "is a major strategic move taken by the Party to build a fair and just society and attain sustainable social and economic development," said Wu Zhongmin, a professor with the Party School of the CPC Central Committee.